Here lies some common hardware that can be useful in keeping your alpine touring ski boots in working order. Chicago Rivets - Sold individually, these rivets screw together so you don't need a press to fix riveted buckles and other parts. The flush heads are gentle on plastic and carbon fiber. Use with Vibratite to keep the rivets from unscrewing. Three lengths available: 3/16", 1/4", and 1/2". Get the middlest length for use with the "toe triangle" on Dynafit TLT 5 & 6 boots. Boot Shims - Sold individually, these shims are an uncompressable cardboard shimto take up volume in a boot. Shims come in 2 thicknesses 1/16" and 1/8" and in one size to trim to fit. Are these the right diameter to replace loose rivets on a LaSportiva Sideral 1.0 instep buckle? Anyone know someone who has done this successfully? Would steel pop rivets be a better choice? Chris, Diameter of these is 5mm, then measure the length you need. If you have access to a rivet gun that would work too. In your text for Chicago Rivets three lengths are mentioned to be available: 3/16", 1/4", and 1/2". When trying to order, 1/4" doesn't appear as an option in drop-down menu. And yes, this is exactly the size I'd like to have. Hi Rasto, when an item does not appear in the menu it means that we are currently out of stock. I've double checked our inventory and that does appear to be the case with the 1/4" size at this time. Would these be the right diameter for a backcountry fix on a Vulcan/Mercury instep buckle strap or toe buckle strap connection to the boot shell? What is the diameter on the barrels? Hey Nick! Totally possible! Might be a better idea to use a t-nut and matching screw just for the sake of getting the tension a bit higher, but the outer diameter of the barrel is 4.95mm. On the Chicago rivets . I have TLT 6 boots. one of the triangle rivets has broke and needs to be replaced. You recommend the middle length which I assume to be 1/4 . Problem 1/4 is not listed in the drop down menu ????. What to do ? Hey Robie! I would get the 1/2 length and then file the threads down. It'll file down pretty easily with a metal file or even outside on the sidewalk or driveway. What size do I need to attach a cuff buckle to a TLT6? 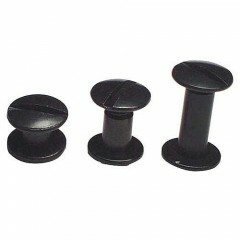 Hi Stephen, in lieu of a rivet press, your best bet for those are steel pop rivets.